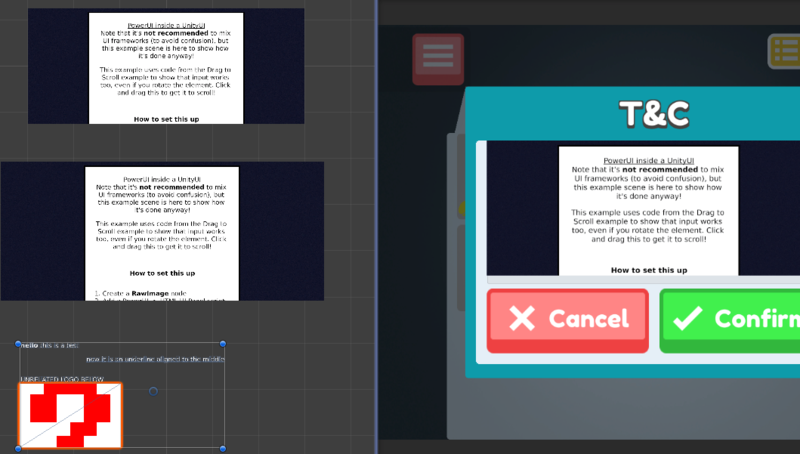 I've been trying out PowerUI due to the need to display HTML formatted text in Unity (e.g. text from https://summernote.org/), using data pulled from a server. As a result, I've been relying on HtmlUIPanel. The aim is to replace the HtmlUIPanel with new data (string), so we can display a variety of things. However, I ran into an issue where HtmlUIPanel wasn't being updated properly (still showing older content). Typically, I would update the contents like this, with the aim of clearing the older content, writing the drag scroller code in then finally the htmlText. Am I missing out something important to make this work? I managed to fix the issue! Hence, I made the Pop Up active first, then modified the document, which led to the intended result of modifying the current HtmlContent, which is being shown in the Pop Up. Also, special thanks to Luke for helping out via email! I'm going to leave this thread up in case anyone encounters a similar issue. Post Reply: HtmlUIPanel not updating properly?